In this example, data were collected from customers who made purchases from a retail company during years 2002 and 2003. 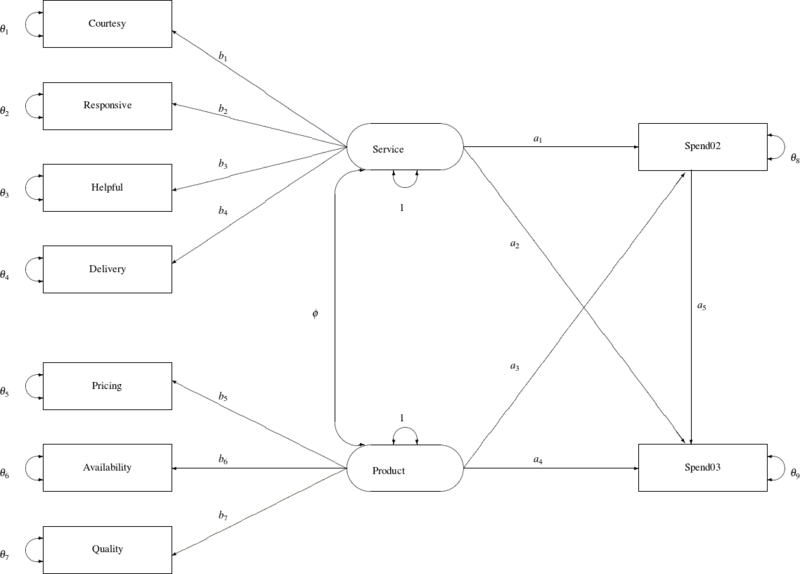 A two-group structural equation model is fitted to the data. For the ratings scales, nine-point scales were used. Customers could respond 1 to 9 on these scales, with 1 representing "extremely unsatisfied" and 9 representing "extremely satisfied." Data were collected from two different regions, which are labeled as Region 1 ( ) and Region 2 ( ), respectively. The ratings were collected at the end of year 2002 so that they represent customers’ purchasing experience in year 2002. How does the overall customer service affect the current purchases and predict future purchases? How does the overall product quality affect the current purchases and predict future purchases? Do current purchases predict future purchases? Do the two regions have different structural models for predicting the purchases? In stating these research questions, you use several constructs that might or might not correspond to objective measurements. Current and future purchases are certainly measurable directly by the spending of the customers. That is, because customer service and product satisfaction and quality were surveyed between 2002 and 2003, Spend02 represents current purchases and Spend03 represents future purchases in the study. Both variables Spend02 and Spend03 are objective measurements without measurement errors. All you need to do is to extract the information from the transaction records. But how about hypothetical constructs such as customer service quality and product quality? How would you measure them in the model? In measuring these hypothetical constructs, you might ask customers’ perception about the service or product quality directly in a single question. A simple survey with two questions about the customer service and product qualities could then be what you need. These questions are called indicators (or indicator variables) of the underlying constructs. However, using just one indicator (question) for each of these hypothetical constructs would be quite unreliable—that is, measurement errors might dominate in the data collection process. Therefore, multiple indicators are usually recommended for measuring such hypothetical constructs. There are two main advantages of using multiple indicators for hypothetical constructs. The first one is conceptual and the other is statistical and mathematical. First, hypothetical constructs might conceptually be multifaceted themselves. Measuring a hypothetical construct by a single indicator does not capture the full meaning of the construct. For example, the product quality might refer to the durability of the product, the outlook of the product, the pricing of the product, and the availability of product, among others. The customer service quality might refer to the politeness of the customer service, the timeliness of the delivery, and the responsiveness of customer services, among others. Therefore, multiple indicators for a single hypothetical construct might be necessary if you want to cover the multifaceted aspects of a given hypothetical construct. Second, from a statistical point of view, the reliability would be higher if you combine correlated indicators for a construct than if you use a single indicator only. Therefore, combining correlated indicators would lead to more accurate and reliable results. One way to combine correlated indicators is to use a simple sum of them to represent the underlying hypothetical construct. However, a better way is to use the structural equation modeling technique that represents each indicator (variable) as a function of the underlying hypothetical construct plus an error term. In structural equation modeling, hypothetical constructs are constructed as latent factors, which are unobserved systematic (that is, non-error) variables. Theoretically, latent factors are free from measurement errors, and so the estimation through the structural equation modeling technique is more accurate than if you just use simple sums of indicators to represent hypothetical constructs. Therefore, a structural equation modeling approach is the method of the choice in the current analysis. In practice, you must also make sure that there are enough indicators for the identification of the underlying latent factor, and hence the identification of the entire model. Necessary and sufficient rules for identification are very complicated to describe and are out of the scope of the current discussion (however, see Bollen 1989b for discussions of identification rules for various classes of structural equation models). Some simple rules of thumb might be useful as a guidance. For example, for unconstrained situations, you should at least have three indicators (variables) measured for a latent factor. Unfortunately, these rules of thumb do not guarantee identification in every case. In this example, Service and Product are latent factors in the structural equation model which represent service and product qualities, respectively. In the model, these two latent factors are reflected by the ratings of the customers. Ratings on the Courtesy, Responsive, Helpful, and Delivery scales are indicators of Service. Ratings on the Pricing, Availability, and Quality scales are indicators of Product (that is, product quality). A path diagram shown in Output 29.28.1 represents the structural equation model for the purchase behavior. Observed or manifest variables are represented by rectangles, and latent variables are represented by ovals. As mentioned, two latent variables (factors), Service and Product, are created as overall measures of customer service and product qualities, respectively. The left part of the diagram represents the measurement model of the latent variables. The Service factor has four indicators: Courtesy, Responsive, Helpful, and Delivery. The path coefficients to these observed variables from the Service factor are , , , and , respectively. Similarly, the Product variable has three indicators: Pricing, Availability, and Quality, with path coefficients , , and , respectively. The two latent factors are predictors of the purchase amounts Spend02 and Spend03. In addition, Spend02 also serves as a predictor of Spend03. Path coefficients (effects) for this part of functional relationships are represented by a1–a5 in the diagram. Each variable in the path diagram has a variance parameter. For endogenous or dependent variables, which serve as outcome variables in the model, the variance parameters are the error variances that are not accounted for by the predictors. For example, in the current model all observed variables are endogenous variables. The double-headed arrows that are attached to these variables represent error variances. In the diagram, to are the names of these error variance parameters. For exogenous or independent variables, which never serve as outcome variables in the model, the variance parameters are the (total) variances of these variables. For example, in the diagram the double-headed arrows that are attached to Service and Product represent the variances of these two latent variables. In the current model, both of these variances are fixed at one. When the double-headed arrows point to two variables, they represent covariances in the path diagram. For example, in Output 29.28.1 the covariance between Service and Product is represented by the parameter . For the moment, it is hypothesized that both 'Region 1' and 'Region 2' data are fitted by the same model as shown in Output 29.28.1. Once the path diagram is drawn, it is readily translated into the PATH modeling language. See the PATH statement for details about how to use the PATH modeling language to specify structural equation models. The PATH statement captures all the path coefficient specifications and the direction of the paths (single-headed arrows) in the path diagram. The first five paths define how Spend02 and Spend03 are predicted from the latent variables Service, Product, and Spend02. The next seven paths define the measurement model, which shows how the latent variables in the model relate to the observed indicator variables. The PVAR statement captures the specification of the error variances and the variances of exogenous variables (that is, the double-headed arrows in the path diagram). The PCOV statement captures the specification of covariance between the two latent variables in the model (which is represented by the double-headed arrow that connects Service and Product in the path diagram). There are two simplifications in this PATH model specification. First, you do not need to specify the parameter names if they are unconstrained in the model. For example, parameter a1 in the model is unique to the path effect from Service to Spend02. You do not need to name this effect because it is not constrained to be the same as any other parameter in the model. Similar, all the path coefficients (effects), error variances, and covariances in the path diagram are not constrained. Therefore, you can omit all the corresponding parameter name specifications in the PATH model specification. The only exceptions are the variances of Service and Product. Both are fixed constants 1 in the path diagram, and so you must specify them explicitly in the PVAR statement. Second, you use a condensed way to specify the paths. In the first three path entries of the PATH statement, you specify how Spend02 and Spend03 are predicted from the latent variables Service, Product, and Spend02. Notice that in each path entry, you can define more than one path (single-headed arrow relationship). For example, in the first path entry, you specify two paths: one is Service===>Spend02 and the other is Service===>Spend03. In the last two path entries of the PATH statement, you define the relationships between the two latent constructs Spend and Service and their measured indicators. Each of these path entries specifies multiple paths (single-headed arrow relationships). You use this simplified PATH specifications in the subsequent analysis. Each variable in the path diagram has a mean parameter that can be specified in the MEAN statement. For an exogenous variable, the mean parameter refers to the variable mean. For an endogenous variable, the mean parameter refers to the intercept of the variable. The means of exogenous observed variables are free parameters by default. The means of exogenous latent variables are fixed zeros by default. The intercepts of endogenous observed variables are free parameters by default. The intercepts of endogenous latent variables are fixed zeros by default. The total number of mean parameters should not exceed the number of observed variables. You use the GROUP statements to specify the data for the two regions. Using the DATA= options in the GROUP statements, you assign the 'Region 1' data to Group 1 and the 'Region 2' data to Group 2. You label the two groups by the LABEL= options. Because the number of observations is not defined in the data sets, you use the NOBS= options in the GROUP statements to provide this information. In the MODEL statement, you specify in the GROUP= option that both Groups 1 and 2 are fitted by the same model—model 1. Next, the path model is specified. As discussed before, you do not need to specify the default mean parameters by using the MEAN statement because the MEANSTR option in the PROC CALIS statement already indicates the analysis of mean structures. Output 29.28.2 presents a summary of modeling information. Each group is listed with its associated data set, number of observations, and its corresponding model and the model type. In the current analysis, the same model is fitted to both groups. Next, a table for the types of variables is presented. As intended, all nine observed (manifest) variables are endogenous, and all latent variables are exogenous in the model. The optimization converges. The fit summary table is presented in Output 29.28.3. The model chi-square statistic is 2820.25. With df = 77 and p < .0001, the null hypothesis for the mean and covariance structures is rejected. All incremental fit indices are negative. These negative indices indicate a bad model fit, as compared with the independence model. The same fact can be deduced by comparing the chi-square values of the baseline model and the fitted model. The baseline model has five degrees of freedom less (five parameters more) than the structural model but the chi-square value is only 399.747, much less than the model fit chi-square value of 2820.25. Because variables in social and behavioral sciences are almost always expected to correlate with each other, a structural model that explains relationships even worse than the baseline model is deemed inappropriate for the data. The RMSEA for the structural model is 0.2986, which also indicates a bad model fit. However, the GFI, AGFI, and parsimonious GFI indicate good model fit, which is a little surprising given the fact that all other indices indicate the opposite and the overall model is pretty restrictive in the first place. PROC CALIS routinely checks the properties of the estimated variances and the predicted covariance matrix. It issues warnings when there are problems. In this case, the error variance estimate of Spend02 is negative, and the predicted covariance matrix for the observed and latent variables is not positive definite and has one negative eigenvalue. You can inspect Output 29.28.4, which shows the variance parameter estimates of the variables. The error variance estimate for Spend02 is –14.40, which is negative and might have led to the negative eigenvalue problem in the predicted covariance matrix for the observed and latent variables. Unlike the previous specification, in the current specification Group 2 is now fitted by a new model labeled as Model 2. This model is based on Model 1, as specified in REFMODEL statement. The ALLNEWPARMS option in the REFMODEL statement request that all parameters specified in Model 1 be renamed so that they become new parameters in Model 2. As a result, this specification gives different sets of estimates for Model 1 and Model 2, although both models have the same path structures and a comparable set of parameters. The optimization converges without problems. The fit summary table is displayed in Output 29.28.5. The chi-square statistic is 29.613 (df = 46, p = .97). The theoretical model is not rejected. Many other measures of fit also indicate very good model fit. For example, the GFI, AGFI, Bentler CFI, Bentler-Bonett NFI, and Bollen nonnormed index delta2 are all close to one, and the RMSEA is close to zero. Notice that because there are no constraints between the two models for the groups, you might have fit the two sets of data by the respective models separately and gotten exactly the same results as in the current analysis. For example, you get two model fit chi-square values from separate analyses. Adding up these two chi-squares gives you the same overall chi-square as in Output 29.28.5. PROC CALIS also provides a table for comparing the relative model fit of the groups. In Output 29.28.6, basic modeling information and some measures of fit for the two groups are shown along with the corresponding overall measures. where and are sample sizes for the groups and and are the discrepancy functions for the groups. Even though T is chi-square distributed under the null hypothesis, in general the individual terms and are not chi-square distributed under the same null hypothesis. So when you compare the group fits by using the statistics in Output 29.28.6, you should treat those as descriptive measures only. The current model is a special case where and are actually independent of each other. The reason is that there are no constrained parameters for the models fitted to the two groups. This would imply that the individual terms and are chi-square distributed under the null hypothesis. Nonetheless, this fact is not important to the group comparison of the descriptive statistics in Output 29.28.6. The values of and are shown in the row labeled "Fit Function." Group 1 (Region 1) is fitted better by its model ( ) than is Group 2 (Region 2) by its model ( ). Next, the percentage contributions to the overall chi-square statistic for the two groups are shown. Group 1 contributes only 3% ( ) while Group 2 contributes 97%. Other measures like RMR, SRMR, and Bentler-Bonett NFI show that Group 1 data are fitted better. The GFI’s show equal fits for the two groups, however. Despite a very good fit, the current model is not intended to be the final model. It was fitted mainly for illustration purposes. The next section considers a partially constrained model for the two groups of data. In this specification, you use a special model definition. Model 3 serves as a reference model. You are not going to fit this model directly to any data set, but the specifications of other two models makes reference to it. Model 3 is no different from the basic path model specification used in preceding examples. The PATH model specification reflects the path diagram in Output 29.28.1. Region 1 is fitted by Model 1, which makes reference to Model 3 by using the REFMODEL statement. In addition, you add the MEAN statement specification. You now specify the intercept parameters explicitly by using the parameter names G1_intercept01–G1_intercept07, G1_InterSpend02, and G1_InterSpend03. In previous examples, these intercept parameters are set by default by PROC CALIS. This explicit parameter naming serves the purpose of distinguishing these parameters from those for Model 2. Region 2 is fitted by Model 2, which also refers to Model 3 by using the REFMODEL statement. You also specify a MEAN statement for this model with explicit specifications of the intercept parameters. You name these intercepts G2_intercept01–G2_intercept07, G2_InterSpend02, and G2_InterSpend03. The G2 prefix distinguishes these parameters from the corresponding intercept parameters in the parent model. All in all, this means that both Models 1 and 2 refers to Model 3, except that Model 2 uses a different set of intercept parameters. In other words, in this multiple-group model the covariance structures for the two regions are constrained to be the same, while the means structures are allowed to be unconstrained. You request additional statistics or tests in the current PROC CALIS analysis. The MODIFICATION option in the PROC CALIS statement requests that the Lagrange multiplier tests and Wald tests be conducted. The Lagrange multiplier tests provide information about which constrained or fixed parameters could be freed or added so as to improve the overall model fit. The Wald tests provide information about which existing parameters could be fixed at zeros (eliminated) without significantly affecting the overall model fit. These tests are discussed in more detail when the results are presented. where k is the number of parametric functions within the simultaneous test. In the current analysis, the component parametric functions are defined in the SAS programming statements , which are shown in the last block of the specification. Essentially, all these parametric functions represent the differences of the mean or intercept parameters between the two models for groups. The first simultaneous test is intended to test whether the mean or intercept parameters in the structural models are the same, while the second simultaneous test is intended to test whether the mean parameters in the measurement models are the same. The fit summary table is shown in Output 29.28.7. The chi-square value is 107.55 (df = 68, p = 0.0016), which is statistically significant. The null hypothesis of the mean and covariance structures is rejected if an -level at 0.01 or larger is chosen. However, in practical structural equation modeling, the chi-square test is not the only criterion, or even an important criterion, for evaluating model fit. The RMSEA estimate for the current model is 0.0382, which indicates a good fit. The probability level of close fit is 0.9275, indicating that a good population fit hypothesis (that is, population RMSEA < 0.05) cannot be rejected. The GFI, AGFI, and parsimonious GFI all indicate good fit. However, the incremental indices show only a respectable model fit. Comparison of the model fit to the groups is shown in Output 29.28.8. Looking at the percentage contribution to the chi-square, the Region 2 fitting shows a worse fit. However, this might be due to the larger sample size in Region 2. When comparing the fit of the two regions by using RMR, which does not take the sample size into account, the fitting of two groups are about the same. The standardized RMR even shows that Region 2 is fitted better. So, it seems to be safe to conclude that the models fit almost equally well (or badly) for the two regions. The constrained parameter estimates for the two regions are shown in Output 29.28.9. All parameter estimates but one are statistically significant at . The parameter _Parm01, which represents the path coefficient from Service to Spend02, has a t value of 1.76. This is only marginally significant. Although all these results bear the title of Model 1, these estimates are the same for Model 2, of which the corresponding results are not shown here. The mean and intercept parameters for the two models (regions) are shown in Output 29.28.10. All the mean and intercept estimates are statistically significant at . Except for the fixed zero means for Service and Product, a quick glimpse of these mean and intercepts estimates shows a quite different pattern for the two models. Do these estimates truly differ beyond chance? The simultaneous tests of these parameter estimates shown in Output 29.28.11 can confirm this. Output 29.28.11 shows two simultaneous tests, as requested in the original statements. The exceedingly large chi-square value 10,460 suggests the composite null hypothesis is false. Individual tests for these hypotheses suggest that each of these hypotheses should be rejected. The chi-square values for individual tests are 10,227 and 185.84, respectively. Similarly, the simultaneous and individual tests of the intercepts in the measurement model suggest that the two models (groups) differ significantly in the means of the measured variables. Region 2 has significantly higher means in variables Helpful, Delivery, and Pricing, but significantly lower means in variables Courtesy, Responsive, Availability, and Quality. Now you are ready to answer the main research questions. The overall customer service (Service) does affect the future purchase (Spend03), but not the current purchase (Spend02), because the corresponding path coefficient (_Parm01) is only marginally significant. Perhaps this is an artifact because the rating was done after the purchases in 2002. That is, purchases in 2002 had been done before the impression about customer service was fully formed. However, this argument cannot explain why overall customer service (Service) also shows a strong and significant relationship with purchases in 2002 (Spend02). Nonetheless, customer service and product quality do affect the future purchases (Spend03) in an expected way, even after partialling out the effect of the previous purchase amount (Spend02). Apart from the mean differences of the variables, the common measurement and prediction (or structural) models fit the two regions very well. Because the current model fits well and most parts of fitting meet your expectations, you might accept this model without looking for further improvement. Nonetheless, for illustration purposes, it would be useful to consider the LM test results. In Output 29.28.12, ranked LM statistics for the path coefficients in Model 1 and Model 2 are shown. Path coefficients that lead to better improvement (larger chi-square decrease) are shown first in the tables. For example, the first path coefficient that is suggested to be freed in Model 1 is the Service <=== Courtesy path. The associated p-value is 0.0008 and the estimated change of parameter value is –0.171. The second path coefficient is for the Service <=== Helpful path, but it is not significant at the 0.05 level. So, is it good to add the Service <=== Courtesy path to Model 1, based on the LM test results? The answer is that it depends on your application and the theoretical and practical implications. For example, the Service ===> Courtesy path, which is a part of the measurement model, is already specified in Model 1. Even though the LM test statistic shows a significant decrease of model fit chi-square, adding the Service <=== Courtesy path might destroy the measurement model and lead to problematic interpretations. In this case, it is wise not to add the Service <=== Courtesy path, which is suggested by the LM test results. LM tests for the path coefficients in Model 2 are shown at the bottom of Output 29.28.12. Quite a few of these tests suggest significant improvements in model fit. Again, you are cautioned against adding these paths blindly. LM tests for the error variances and covariances are shown in Output 29.28.13. Using , you might consider adding two pairs of correlated errors in Model 2. The first pair is for Delivery and Courtesy, which has a p-value less than 0.0001. The second pair is Pricing and Responsive, which has a p-value of 0.027. Again, adding correlated errors (in the PCOV statement) should not be a pure statistical consideration. You should also consider theoretical and practical implications. LM tests for other subsets of parameters are also conducted. Some subsets do not have parameters that can be freed, and so they are not shown here. Other subsets are not shown here simply for conserving space. PROC CALIS ranks and outputs the LM test results for some default subsets of parameters. You have seen the subsets for path coefficients and correlated errors in the two previous outputs. Some other LM test results are not shown. With this kind of default LM output, there could be a huge amount of modification indices to look at. Fortunately, you can limit the LM test results to any subsets of potential parameters that you might be interested in. With your substantive knowledge, you can define such meaningful subsets of potential parameters by using the LMTESTS statement. The LM test indices and rankings are then done for each predefined subset of potential parameters. With these customized LM results, you can limit your attention to consider only those meaningful parameters to be added. See the LMTESTS statement for details. The next group of LM tests is for releasing implicit equality constraints in your model, as shown in Output 29.28.14. Recall that the measurement and the prediction models for the two regions are constrained to be the same by model referencing (that is, the REFMODEL statement). Output 29.28.14 shows you which parameter can be unconstrained so that your overall model fit might improve. For example, if you unconstrain the first parameter _Parm01, which is for the path effect of Spend02 <=== Service, for the two models, the expected chi-square decrease (LM Stat) is about 0.0158, which is not significant (p = .9001). The associated parameter changes are small too. However, if you consider unconstraining parameter _Parm06, which is for the path effect of Courtesy <=== Service, the expected decrease of chi-square is 19.22 ( ). There are two rows for this parameter. Each row represents a parameter location to be released from the equality constraint. Consider the first row first. If you rename the coefficient for the Courtesy <=== Service path in Model 1 to a new parameter, say "new" (while keeping _Parm06 as the parameter for the Courtesy <=== Service path in Model 2) and fit the model again, the new estimate of _Parm06 is 0.2852 greater than the previous _Parm06 estimate. The estimate of "new" is 0.3196 less than the previous _Parm06 estimate. The second row for the _Parm06 parameter shows similar but reflected results. It is for renaming the parameter location in Model 2. For this example each equality constraint has exactly two locations, one for Model 1 and one for Model 2. That is the reason why you always observe reflected results for freeing the locations successively. Reflected results are not the case if you have equality constraints with more than two parameter locations. Another example of a large expected improvement of model fit is the result of freeing the constrained variances of Courtesy among the two models. The corresponding row to look at is the row with parameter _Parm13, where the parameter type is labeled "COVERR" and the values for Var1 and Var2 are both "Courtesy." The LM statistic is 45.255, which is a significant chi-square decrease if you free either parameter location. If you choose to rename the error variance for Courtesy in Model 1, the new _Parm13 estimate is 0.8052 smaller than the original _Parm13 estimate. The new estimate of the error variance for Courtesy in Model 2 is 0.7211 greater than the previous _Parm13 estimate. Finally, the constrained parameter _Parm15, which is the error variance parameter for Helpful in both models, is also a potential constraint that can be released with a significant model fit improvement. In addition to the LM statistics for suggesting ways to improve model fit, PROC CALIS also computes the Wald tests to show which parameters can be constrained to zero without jeopardizing the model fit significantly. The Wald test results are shown in Output 29.28.15. In Output 29.28.15, you see that _Parm01, which is for the path effect of Spend02 <=== Service, is suggested to be a fixed zero parameter (eliminated from the model) by the Wald test. Fixing this parameter to zero (or dropping the Spend02 <=== Service path from the model) is expected to increase the model fit chi-square by 3.085 (p = .079), which is only marginally significant at . As is the case for the LM test statistics, you should not automatically adhere to the suggestions by the Wald statistics. Substantive and theoretical considerations should always be considered when determining whether a parameter should be added or dropped.